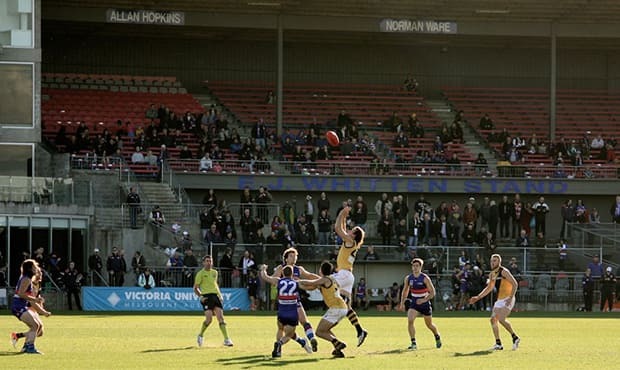 Richmond’s VFL side suffered its second tight loss in as many weeks as Footscray slammed on three goals in the final 10 minutes to defeat the Tigers by nine points at Whitten Oval. Bulldogs’ forward Lachlan Dalgleish proved to be a thorn in the Tigers’ side as he slotted the final three goals of the match, with Footscray prevailing 11.8 (74) to 9.11 (65). Richmond led for the majority of the day, and let slip an eight-point three-quarter-time lead as it squandered chances in front of goal and failed to halt the Bulldogs’ late charge. The Tigers started the critical final term in superb fashion as Jacob Townsend slotted his second goal of the day, handing the Tigers a handy 14-point cushion. As they’d done for the majority, however, the Bulldogs responded immediately with back-to-back goals, cutting the margin to two points. Moments later, Mabior Chol mowed down an unaware Bulldogs’ defender and received just reward for his outstanding tackle as he coolly went back and slotted his only major, extending the Tigers’ lead to eight points. That’s where the good news ended unfortunately, as Footscray and Dalgleish snatched the lead late and never looked back. Richmond struggled to play with the same dash and dare between the arcs as it had the week prior, which led to inconsistency of quality entries going inside 50. The key message from coach Craig McRae for the match was to “Start how we finished”, after the Tigers pushed ladder-leaders Casey all the way the week previous. The Tigers welcomed back a swag of experience to aid their cause, with Ivan Maric, Ty Vickery, Jake Batchelor and Kane Lambert suiting up against the Dogs. Maric and Lambert combined brilliantly at the opening bounce as the pair set the scene for an encouraging first term around the clinches. Lambert accumulated the ball at will, and also waltzed into an open goal sinking a major, while Maric fought out an intriguing battle with Dogs’ big man Will Minson. It was a scatter-gun approach in front of goal for the Tigers in the first term, epitomised by a Lambert set-shot which hit the post on the quarter-time siren, handing the Tigers a 13-point lead. Richmond dominated the main statistical areas in the first term, recording +15 uncontested marks, +10 contested ball, and +5 clearances but didn’t gain just reward for its effort. The Tigers’ pressure early was impressive, with forward Jake Aarts cashing in midway through the second term, snapping his first for the day and Callum Moore kicking the next major, following a deft-touch turnover by Ben Lennon. The pair’s goals pushed the Tigers’ lead out to 25 points before the Dogs hit back late, and cut the margin to 18 points at the main change. The game turned a little hectic in the latter stages of the second quarter, with both sides turning the ball over at will. Richmond just needed to control the tempo of the game in the second half and convert their dominance to pressure on the scoreboard. Tigers’ coach Craig McRae implored his charges to remain calm with ball in hand, and restrict turnovers, which was the Bulldogs’ main source of scoring. The third term didn’t start to plan as Minson shifted Troy Chaplin close to goal, and slotted his first for the quarter. Returning Tiger Todd Elton hit back for the visitors, before Minson repeated the dose and cut the margin to eight points after an error-riddled third term. The final term was one of momentum and the Bulldogs stormed home with three goals in red time as the Tigers frustratingly let the game slip from their grasp. Richmond’s picture of consistency Adam Marcon put in his best performance for the year, finishing with 35 disposals and a goal. Key Tigers Kane Lambert (32 disposals), Sam Darley (26), Andrew Moore (24) and Ben Lennon (23) were all handy contributors, while Ty Vickery finished with 17 disposals, six marks and three tackles. The Tigers have a bye this week, before they prepare to face Box Hill on Sunday, July 24 at Punt Road Oval.